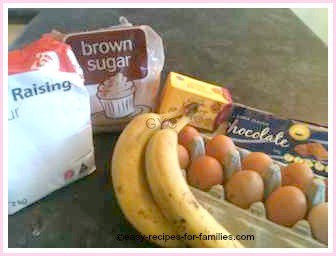 On this page you'll find the step by step photo tutorial of this easy banana cake recipe. This page shows the individual steps involved in this remarkably simple recipe and is a photo tutorial for cooking novices. To go to the recipe for this moist and scrumptious banana and coconut cake, click on the image or button. The recipe has the proportions of ingredients and the instructions. Before starting the process, turn on the oven to preheat, at 360F/180C. The objective of preheating is so that the oven temperature is even throughout the cavity by the time the cake is ready to be baked. 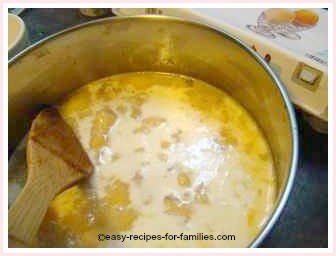 Melt butter and sugar in a sauce pan till the butter's melted and be sure to take it off the heat immediately. 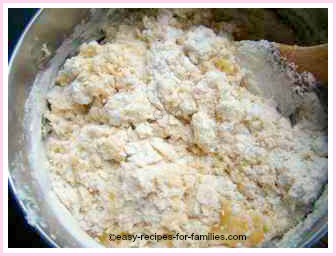 But keep stirring till the mixture becomes a thick homogenous mass like this, in the photo. You can see it is quite thick. Now, be sure to take the pot off the heat as soon as the butter has melted. The heat is not to cook, but to make it easier to combine. In this picture, you'll see the added beaten eggs and bananas. 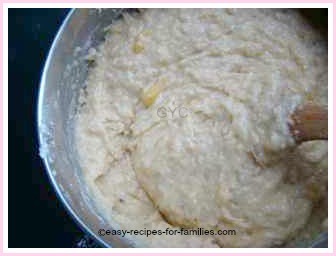 It looks like a horrific mess, but as you stir, the bananas will bread up and blend into the batter. Pour in the milk and combine. Tip in all the flour and coconut. 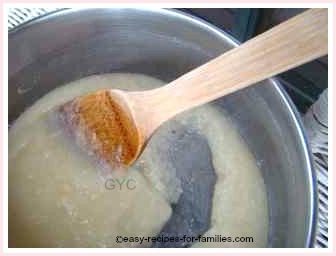 It will look like a dry mess but keep stirring and it will become a smooth batter. Really. 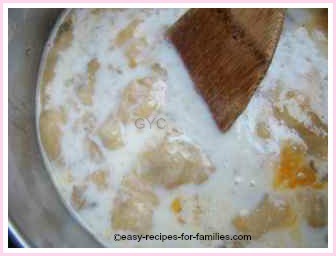 The cake mixture will become smooth just like this, with lumps of banana through it. That's fine for the banana not to be absolutely mushed up. I find it gives the cake character. 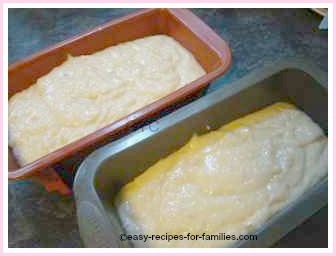 Pour the batter into two loaf "tins". You can see I use flexible non-stick silicone bake ware. I thoroughly recommend these as it saves so much time, not having to line and grease your pans. 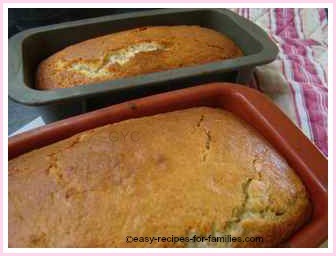 I like making my cakes in loaf tins as there's much less waste, than a round cake. If you prefer, use a 9" round cake mold. Use a cake tester to check that the cake is cooked - it's ready when the skewer comes out perfectly clean. 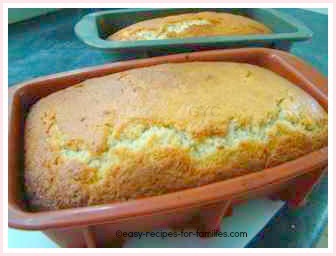 Pull on the sides of the loaf "tin" to separate the cake from the mold and allow to cool till it can be handled. It's so easy to remove the cake from flexible silicone bakeware. Enjoy hot with lashings of butter or just as is. It's superbly delicious, and so marvelously easy to make! This easy banana cake recipe is ideal for pot luck dishes ( I made this to a "bring a plate" party and I'm pleased to report it was finished in no time at all) and for school lunch boxes. I love recipes like this where it's so simple to whip up and takes hardly any time to produce a delicious treat. Leave Easy Banana Cake Recipe to explore the hundreds of easy recipes for scrumptious desserts, cakes and cookies.